Last November, I had the opportunity to attend the Pride of New York Harvest Festival at the New York State Fairgrounds in Syracuse. The event featured a bounty of food and agricultural products produced around the state including a wide variety of products from the Finger Lakes Region. While wine was the main focus of my visit, it was difficult to ignore all of the other products which included artisan cheese, breads, honey and maple products, produce, and meat products including free range and organic products. The exhibit will continue August 25th through September 5th at the annual New York State Fair. If you are planning on attending the fair, I highly recommend taking the time to visit the Horticulture Building that not only houses the Pride of New York exhibit, it also houses the New York Apple Exhibit and New York Maple Exhibit. Of course, there will be plenty of award winning New York State wines to sample, including the finest from the Finger Lakes. Don’t forget to go by the HP Hood Potato Booth to get your baked potato topped with New York butter and sour cream. You can easily spend a full day in this building alone. There are many attractions at the fair besides food. With twelve days of free music, the midway, animal exhibits, arts and crafts, competitions, etc., there is plenty to do and see. A complete listing of attractions can be found here. If a trip to the fair isn’t on your calendar, it’s not too late to plan a trip to Syracuse to enjoy the festivities. With daily admission at just $10, the New York State Fair is an affordable way to spend a late summer day or two. Tonight I attended my second Finger Lakes Wine and Culinary Event at Lyons Mansion in Rochester. This event is sponsored by Jeff Arnold, founder of Discover Rochester and the Finger Lakes Destination and Wine Card. Chef Don Antinore co-hosted the event adding color commentary throughout the evening. Three Seneca Lake wineries, Red Tail Ridge Winery, Atwater Estate Vineyards, and Red Newt Cellars, were scheduled for the event. Unfortunately, Red Newt was a no-show due to the weather. On the culinary side, Chef Brad Yearwood, Executive Chef at Cobblestone Creek Country Club and winner of several regional culinary competitions, was on hand to prepare appetizers and to give a cooking demonstration. With a full house and only two out of three wineries present, the tasting tables were packed. The crowd made maneuvering around the room tricky too. Despite the cramped quarters, I was able to sample each of the wines without much trouble. I was even able to go back for a second taste for a few of the wines and even a third taste for my favorites. The wineries were well prepared. I started off tasting with Red Tail Ridge’s Good Karma, a 80%/20% blend of Chardonnay and Riesling. This wine had 2.7% residual sugar but was well balanced with acid to cut the sweetness so it tasted drier than the RS might suggest. It had a nice, crisp citrus finish. Next I tried the 2008 Barrel-Fermented Chardonnay. This wine is made from estate grown grapes and had a smooth oak flavor and a silky mouth feel that is common with a good oaked Chardonnay. Food started coming out of the kitchen so I jumped right in and tasted the Crab Salad on a Crispy Wonton. The salad was delicious with large pieces of crab. The crispy wonton added a nice crunch to the appetizer. Next, came a Leek wrapped Ahi Tuna which was very good, but I liked the cucumber wrapped variation with a mayo and sweet Thai chili sauce that the Chef prepared in his demonstration much better. I worked my way over to the Atwater table to taste their 2008 Pinot Gris and their 2009 Dry Riesling. The Pinot Gris had a crisp grapefruit flavor with the right amount of acid while the Riesling had lemon citrus flavors and was also well balanced. I’ve grown to appreciate the importance of balancing acid in a wine. Overly acidic wines go down hard. More food came out on the floor including a Beef Carpaccio with Carbonated Grapes, Breaded Eggplant with Mozzarella and Pesto, and Green Tea Soba Noodles with a Hoisin and Teriyaki sauce. I found the beef to be bland. The eggplant was lightly breaded and cooked perfectly. The pesto was light and complimented the Mozzarella nicely. The noodles were served twirled on a fork which was clever and the sauce was light and flavorful. The second hour of the event featured red wines. Red Tail Ridge served the 2008 Lemberger made with Martini Family Vineyard (It’s a Wonderful Life?) grapes and estate grown 2008 Pinot Noir. The Pinot was light bodied and fruit forward but a bit young tasting. The Lemberger was medium bodied with a light smokey finish. Atwater served their Big Blend, a blend of Cabernet Sauvignon (33%), Lemberger (26%) Syrah (22%), and Merlot (19%). This was an interesting wine with different flavors coming to mind with each sip. It had a character all its own not dominated by any one particular variety. They also served their 2007 Meritage but by time I tasted it I had already gone back to have second tastes of other wines so my palate was past the point of discerning flavors in the wine. It tasted good, I just couldn’t tell you how good. By time Chef Yearwood gave his cooking demonstration, the crowed had thinned by at least half so it was easy to see him in action. Jeff, feeling the need to fill in the gap that Red Newt left, went to the wine store and bought a few Finger Lakes wines to sample. He asked trivia questions about the Finger Lakes and their wineries as he poured wine to those who lingered after the cooking demonstration. Overall, it was an interesting evening. The crowd was friendly and the wine and food was very enjoyable. I particularly enjoyed talking with Mike Schnelle, owner of Red Tail Ridge, and Chef Yearwood. They were eager to answer my questions and had a lot to offer about their craft. Jeff and Chef Don did a great job handling the crowd and keeping things interesting and running smooth. My only criticism, which I find true for many wine tasting events, is that it was too crowded. I found the same thing at Deer Run’s food and wine event before Christmas. Half the number of people would have been more appropriate for the space. It’s been well over a month since I’ve posted but that doesn’t mean I haven’t been busy on the wine trail. Just before Christmas, my girlfriend Katy and I visited two wineries, Deer Run on Conesus lake and Ventosa Vineyards on Seneca Lake. The week after Christmas, I visited Kings Garden Vineyards on Seneca Lake as well. Deer Run hosted a holiday food and wine event featuring seven dishes paired with as many wines. The menu included Cranberry Dip an Pita Chips paired with Fawn, a fortified blend of estate grown Traminette and Valvin Muscat, Pumpkin and Sweet Potato Soup paired with Valvin Muscat, Horseradish Encrusted Salmon paired with Traminette, Greek Beef Stifado paired with Merlot, Sweet Potato Apricot Bake paired with Cayuga White, Spinach, Apple and Glazed Pecan Salad paired with Seyval, and Pears Poached In Wine with Vanilla Ice Cream Paired with Cabernet Sauvignon. My favorite dish by far was the Pumpkin and Sweet Potato Soup. It had an Asian twist with lemongrass, ginger, and coconut. We received copies of the recipes so I was able to make the soup for Christmas dinner. It was delicious and a big hit. The Sweet Potato Apricot Bake was also very good but I didn’t like the wine pairing. The Cayuga White was overpowered by the orange in the dish. The beef and Merlot paired well but I would have switched the Merlot with the Cabernet Sauvignon because I think the Cab would have held up better to the beef and the Merlot would have been lighter with the pears. Both of these reds were delicious and were my favorites of the night. Katy’s favorite was the 2008 Corot Noir that we sampled before the main event. I liked it as well so a bottle made the trip home with us. We happened to enjoy it the other night for dinner. Our evening at Ventosa was highlighted by jazz and holiday music by the trio of Johnny Russo, Doug Robinson, and Brian Earle. These talented musicians from Ithaca are well known in the area and I have seen Johnny and Doug perform on several occasions in the past. The crowd was in a festive mood as we broke out in song with every holiday tune the trio played. The staff at Ventosa is wonderful. Melinda happened by as we walked in and she whisked us over to the tasting bar and pored us samples of their newest wines. Jessica and RJ were there as well and we had a great conversation as we listened to the music, sang, and drank wine. They are a great team and took care of all the guests like they were family. The cafe staff did a great job as well. Katy and I shared a specialty pizza that was fantastic. I’m sorry I didn’t take notes on the wines and food to provide a better description. I was having too much fun to worry about details. Fortunately, I’ve written about their wines in the past so you can refer to earlier posts to get a feel for Ventosa’s wine. I stopped in at Kings Garden before heading out on the trail in the Finger Lakes National Forest for an overnight hiking and camping trip with my nephew Brian and friend Chris. I wanted to see what happens at a winery on a mid-winter week day. I emailed Corinne Oleksyn, who owns the vineyard along with her husband Mike, telling her I would be in the area and would like to visit. She said Mike would be busy racking wine and I was welcome to stop in. I startled Mike when I arrived. He was standing right behind the barn door as I opened it and probably wasn’t expecting anyone at that particular moment. He was cleaning the hose and pump used to rack the wine between barrels. He explained the racking process and its importance in removing sediment from the wine. As the wine matures in the barrel, particles suspended in the wine settle and form a sediment in the bottom of the barrel. The wine is periodically drawn off into a clean barrel, leaving the sediment behind. It’s a relatively simple process but labor intensive. Mike hefted a barrel off its stand, rolled it outside to the concrete pad next to the barn so he could rinse out the sediment using hot, high pressure water. It took about ten or fifteen minutes to clean the barrel thoroughly. He then brought the barrel back into the barn, hefted it back onto the stand, put one end of the transfer hose into the clean barrel and the other end into an aging barrel of Cabernet Sauvignon, and turned on the pump. It took several minutes for the wine to transfer. He then turned off the pump, withdrew the hose from the barrels, and repeated the process using a different barrel of maturing wine. Watching Mike lift the 100 plus pound barrels on and off the stands impressed me. Looking back into the barn where dozens of barrels were waiting to be racked impressed me even more. Mike was kind enough to share a sample of the wine as he racked it. It was delicious with a wonderful body and deep red color and the plum and berry flavors enhanced by the oak. This wine is going to be great once it finishes and ages a bit in the bottle. I also sampled a Chardonnay that was produced with Sauternes yeast which gave it a hint of grapefruit. It was off dry and very bright. This is another star in the making. Mike sent me off with a bottle of the Cab and the remaining Chardonnay that we sampled to enjoy around the campfire that night. We drank the wine as the fire blazed and warmed us in the clear, fifteen degree winter’s night air. It was a treat having the wine as we looked into the moonless sky, awestruck by the stars and Milky Way. Be sure to check out the event calendar for your favorite wine trail or winery. There are plenty of events scheduled this winter so there is sure to be something for everyone. In 2010, there were 19 new posts, not bad for the first year! There were 88 pictures uploaded, taking up a total of 76mb. That’s about 2 pictures per week. The busiest day of the year was May 18th with 86 views. 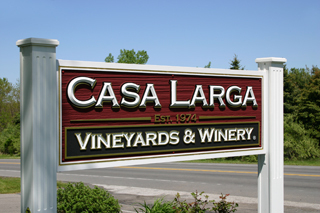 The most popular post that day was Casa Larga Vineyards – Rochester’s Suburban Winery. The top referring sites in 2010 were facebook.com, networkedblogs.com, fingerlakeswinetrailcard.com, stumbleupon.com, and stressingthevine.com. Some visitors came searching, mostly for finger lakes wine guy, finger lakes wine blog, chateau dusseau, cascades indoor water park, and hotchebaba. I found myself on the road again this past weekend, this time to New Jersey for some personal business. I had to be in Newark the first thing Monday morning so I decided to drive to Scranton Pennsylvania Sunday night and continue on to Newark in the morning. Since my home town of Cortland is on the way to Scranton, I figured I would stop to spend some time with my family. Skaneateles happens to be on the way to Cortland and as luck would have it there’s a winery just south of Skaneateles along the way as well. I think you can see where I’m going with this. Anyela’s Vineyards is located on the west side of Skaneateles Lake on route 41A about four and a half miles south of the village. Anyela’s is the only winery on the lake so it would be my only winery stop for the afternoon. Anyela’s is rather unique in that it’s one of the highest wineries in the region. Its vineyards are located on slopes that are more than 1000 feet above sea level. This is much higher when compared to vineyards on Cayuga and Seneca lakes that are typically below 600 feet. This may not seem to be a significant difference in elevation but it’s enough to make a big difference in average temperatures, frost and snowfall. Because of this colder climate, Anyela’s carefully takes their vines from their trellises each fall after the harvest and buries them to protect their fruit bearing buds from the harsh winter. In the spring the vines are unearthed and placed back on the trellises. This is a very labor intensive process that no doubt limits the number of acres Anyela’s can successfully manage. This isn’t necessarily a bad thing because maintaining lower acreage allows them to concentrate on producing higher quality fruit. The building that houses the tasting room is only a few years old. It has a tall cathedral ceiling with an opening to a cupola perched on the roof. There’s a great room in the back with a large stone fireplace that is ideal for parties and special occasions. A patio is located off to the side of the building and a second patio area is located on a path away from the building. Both patios provide a nice view of the lake. Further up the hill are two new buildings, one of which houses offices and storage space and the other, still under construction, will be a production facility. I was the only customer in the tasting room when I arrived. Perhaps because it was later in the afternoon or maybe the cold damp weather was keeping people away. Either way I wasn’t complaining because I didn’t have to wait to be served or bump elbows with other people at the tasting bar. I introduced myself to the staff on duty which included Patricia Nocek, one of the owners, Gail, who was busy doing paperwork at the front desk, and Chris, who is behind the tasting bar. I struck up a conversation with Patricia, asking her questions about the winery. We discussed things such is how they bury the vines each fall, the new construction up on the hill, and the vegetable gardens that provide fresh vegetables for salads and soups served in the winery by Chef Luke Houghton. I got the feeling that Patricia was preoccupied with some task at hand so I turn my attention to Chris and the wine tasting. Chris, like Patricia, was very business-like and didn’t seem to want to engage in conversation much. He was very courteous and answered all the questions that I asked to the best of his ability, however. The wines I tasted included the 2009 Chardonnay, 2009 Riesling, 2007 Pinot Noir, 2007 Merlot, 2007 Cabernet Franc, and the 2007 Overlay. The Chardonnay is a blend of barrel and stainless steel fermentations. It is lightly oaked, well balanced and has a light lemon finish. The tropical fruit flavors of the Riesling stand out nicely. The sweetness and acidity are well balanced and it felt very crisp and bright on the palate. The 2007 Pinot Noir is a 2010 Florida State Fair silver medal winner. It’s a light bodied wine with subtle strawberry notes that become more pronounced after a few sips. The Merlot is a medium bodied wine with cherry and plum flavors and a slightly spicy finish. The Cabernet Franc is also medium bodied. I found it better balanced, smoother, with more pronounced fruit flavors than the Merlot. The Overlay is a blend of Cabernet Franc, Pinot Noir, Shiraz and Cabernet Sauvignon. It is light to medium bodied with delicious berry flavors. It was the smoothest of all the reds that I had tasted and was my favorite wine of the day. A bottle ended up coming home with me. After the tasting I walked around the grounds for a while with my faithful, four legged companion, Sierra. We checked out the construction and vegetable gardens as we took in the view of lake in the valley below. It was cold and overcast but the sun broke on the hilltops on the far side of the lake which lifted my spirits and was a nice way to end the visit. Last Saturday was a cool, fall day. I spent the morning doing chores around the apartment and was looking forward to going to the Canandaigua Wine Walk with Katy in the afternoon then heading over to Seneca Falls to meet my family at the Saint Anthony’s festival afterwords. The Wine Walk is a reoccurring event sponsored by the Canandaigua Merchant Association and is designed to get people familiar with the shops and restaurants on Main Street. The carrot in this case is Finger Lakes wine. It’s apparently effective since there was a respectable turn out for the event judging from the lines I saw at each stop along the walk. If you’re not familiar with Canandaigua, Main Street is also Route 332 which is a four lane highway that leads from the New York State Thruway to Routes 5 and 20, the other major highway running east and west through the region. There’s a tree lined median that divides Main Street with street-side parking and wide sidewalks that make it inviting to stop and shop or grab a bite to eat. I have to say that for all the times I’ve been to Canandaigua, I’ve never stopped at any of the places on Main Street. I’ve always headed straight to the lake, bypassing the Main Street merchants along the way. Perhaps this is common and is a motivating factor behind the Wine Walk. Our first stop was Artiques Heirlooms and Art. We parked on the street a few car lengths away and immediately saw the purple balloons identifying the shop as a Wine Walk participant. The entry fee is $5 per person which covers the cost of a wine glass and the tastings. There were eight participating merchants, so this was a bargain considering tastings typically cost a dollar or two at the wineries. I was put back at first by the length of the line for the tasting which ran forty or more feet though the store and out into the street. I almost asked for a refund because I wasn’t much in the mood for long lines. I had imagined the wineries setting up outside on the sidewalk where there would be more room. It seemed a bit crowded inside to accommodate so many people. We decided to skip this stop for the time being and headed across the street to try our luck at Pulp Nouveau Comix who teamed up with Kings Garden Vineyards from Seneca Lake for the wine walk. I’ve never heard of this winery so it was a treat to try something new. I was happy to see that the line was quite a bit shorter and moved along rather quickly. This was partly due to the wineries limiting their tastings to four wines. Katy and I perused through some of the comics while waiting in line. I never knew there were so many different comics. I knew there were more titles than Super Man, Wonder Woman or The Hulk, but didn’t imagine Jack of Fables, a western themed comic. Apparently the West wouldn’t have been wild without Jack of Fables. Our next stop was Pickering Pub and Fulkerson Winery, also located on Seneca Lake. Pickering Pub is your typical neighborhood pub complete with sports on TV, a full pub menu, and a friendly local crowd. It was rather busy for a Saturday afternoon. They put out a platter of tasty Chicken Quesadillas for the wine tasting crowd. The quesadilla tasted just like what I make at home, which means I liked it a lot. I took a look at the menu and it had typical pub fare including an array of appetizers, burgers, sandwiches, and salads along with an assortment of dinner items including beef, fish, and pasta. I would definitely consider coming back the next time I’m in town looking for something to eat. Bubuli and 1852 Hazlitt Vineyards was next on the list. Bubuli is a chic women’s clothing store that would definitely be of interest to my daughter. While I didn’t pay much attention to the clothes, I did pick up a tip for dinner. More on that later. I’ll also let you check out their website to get a feel for what they offer rather than trash their business in a futile attempt to describe it. Pesky Y chromosome. Hazlitt was set up outside in back of the store which gave the wine crowd a bit more elbow room, although the line here was short for some reason. I think it just worked out that way with traffic flow. G. Jones Furniture featured Pittsford’s Dolce CupCakery who offered an array of bite sized cupcakes to sample. Katy and I both had a Key Lime cupcake. The cake didn’t taste much like key lime, but the frosting did. It was good; I just wish I was able to sample more. Maybe I should have asked. Leonard Oakes Estate Winery paired up with Finger Lakes Gallery & Frame. Leonard Oakes was the only non Finger Lakes winery on the walk. They are located in Medina, NY which is a canal town between Brockport and Lockport. The line grew long again in the gallery. This was fine because I knew the lines were moving fast. This also gave Katy and I a chance to chat it up with other wine walkers, including Don Stevens, the event organizer. It also gave me a chance to look around at some of the wonderful photographs displayed in the gallery. I immediately recognized the work of John Francis McCarthy who happens to be one of my favorite photographers. He had a couple of prints of the Canandaigua water front that were stunning. John Francis knows how to capture the mood and many dimensions of his subject by shooting in the most interesting light conditions. I wish I could take one photograph as good as his. The gallery was quite large and had a wide range of pieces on display as well as a full frame shop. I could have spent another hour in there easily. We had time for two more stops on the walk, Simply Crepes with Wagner Vineyards and Anthony Road Wine Company at Artiques Heirlooms and Art, our first stop where we bought our wine glasses. There was one more destination, the Lumberyard Grill featuring the beers of Custom BrewCrafters from Honeoye Falls, but we didn’t have time for that. It was 7:00 and we were hungry. We headed out towards Seneca Falls when my sister called and said they were on their way home because it was cold, damp, and the kids were getting tired. I thought about going anyways because I was looking forward to a bowl of giblets, you have to try the giblets, but decided it was better to turn around and eat dinner in Canandaigua. I overheard the ladies in Bubuli mention Rio Tomatlan as being a fantastic Mexican restaurant, and suggested it to Katy for us to try. She eagerly agreed. 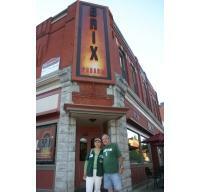 The restaurant is located just off Main Street so it was convenient to get to. There was a parking lot just across the street which was also convenient. The restaurant was busy, which was a good sign. We ordered a couple margaritas and took a seat at a small table near the bar while we waited for our dinner table. The margaritas were good but not exceptional and they were a bit pricey. The complimentary chips and salsa were very good. Both were obviously freshly made. The chips were thick and crunchy. The salsa was full of fresh diced tomatoes, not saucy like jarred salsa. There was plenty of garlic, onion, and cilantro. For dinner, Katy ordered a combination plate with chicken, beef, and pork which was served with Rio Tomatlans Rice and refried beans. Katy liked the flavor of the meat dishes but said the chicken and beef were dry and over cooked. I had the Mole Poblano, a traditional Mexican dish with chicken, rich chocolate pepper nut sauce served with a poblano pepper rice and corn tortillas. The mole was some of the best I’ve ever had. It had rich, complex flavors and a deep brown color I expect. My chicken was dry and over cooked as well. It detracted from the dish somewhat, but the mole was so good you could have served it with beef jerky and I wouldn’t have complained too much. I also prefer the dish served with a whole chicken breast rather than pieces of chicken. I also like it topped with sesame seeds. Okay, now I’m being picky. Did I mention the mole was fantastic? I will definitely go back for more. Oh, I almost forgot the desert. I was about to suggest Flan but Katy overheard the people at the next table order Tres Leches and said I had to try it. Tres Leches is cake saturated with a delicious blend of three different types of milk with a Mezcal whipped cream, coconut, fruit and a hibiscus flower sauce. It was fantastic. It dissolved in your mouth as soon as it hit your tongue which was a very interesting feeling on top of the delicious flavors. You might have noticed I didn’t write about the wine at all. I figured I would focus on the merchants and the experience rather than the wine this time around. Sometimes it’s not about the wine. The wine complimented the experience rather than being the experience itself. I did take notes on the wine and would summarize the tasting experience by saying each winery put their best grape forward for the event. There was a good variety of wines presented which were very representative of the styles of wine found throughout the Finger Lakes. Hazlitt and Leonard Oakes were my favorites of the day with consistently excellent wines. I’m sure I’ll visit these wineries in the coming months to give a full review of their wines. I hope the next wine walk features different merchants so I get to discover something new about the beautiful city of Canandaigua. Since I’ve started my blog, I’ve had the opportunity to meet many people associated in one way or another with Finger Lakes Wine. I’ve met winery owners, wine makers, tasting room managers, tasting room staff, and every day people who simply enjoy wine. One new acquaintance is Jeff Arnold, founder of Discover Rochester and the Finger Lakes Wine Trail Card. Discover Rochester is a Facebook page and soon to be launched online magazine dedicated to all things Rochester. Finger Lakes Wine Trail Card is a Finger Lakes wine discount card that entitles the bearer to discount wine purchases at over thirty five Finger Lakes Wineries. As part of these endeavors, Jeff hosts various wine related events including limo tours, social mixers, and wine tastings. Katy and I invited a couple of friends to join us at one of these events; a wine and culinary tasting at Lyons Mansion on East Avenue, home of the Rochester Academy of Medicine. This event featured wines from Shaw Vineyards, Billsboro Winery, and Fox Run Vineyards. Also featured were the culinary creations of Chef Carlo Peretti, executive chef at the New York Culinary Center in Canandaigua. Chef Don Antinore added colorful commentary throughout the night in introducing the wineries and Chef Carlo. Chef Don was recently inducted into the American Academy of Chefs’ Hall of Fame. Lyons Mansion is one of East Avenue’s grand mansions and was home to the prominent Lyon family until 1938 when it was donated to the Rochester Academy of Medicine. It provided the perfect setting for the wine and culinary event. The large, wood paneled parlor is flanked by a library, dining room, and sun room and provided ample space for the guest to mingle while we enjoyed our wine and hors d’oeuvres. There is also a mezzanine overlooking the parlor that is accessible through a hidden door off the main staircase. The first hour of the wine tasting was dedicated to white wines with the second hour dedicated to reds. We started the tasting with Shaw Vineyards. Steve Shaw and his son Steve Jr. were pouring their 2007 Riesling and their 2009 LiBella Pinot Grigio. The Shaw label is used for their serious, premium wines while the LiBella Label is marketed to more relaxed wine enthusiasts. This dual label approach is not new to me. Dr. Franks on Keuka Lake has Salmon Run as a second label. Heron Hill Winery brands some of their wines with the Ingle Vineyard label. The Riesling had 3.2% residual sugar that was balanced with a fair amount of acid that made it drink like a 1.5% RS wine. That is to say, it tasted a lot drier than the sugar numbers would suggest. I found this very interesting. It goes to show that numbers don’t always tell the whole story. I enjoyed the crisp lemon finish of the 2007 Riesling as well. The Pinot Grigio at 1.4% RS tasted slightly sweeter than the Riesling. It was light bodied with a crisp clean fruit flavor. Steve Jr. pointed out that the Pinot Grigio is the first Finger Lakes wine to be listed by K & L Wine Merchants, a high end California wine retailer. We also sampled Shaw’s 2006 Gewürztraminer. Next we visited the table featuring Billsboro and Fox Run wines. Noel Uzemack represented both wineries. Noel is an instructor at the New York Culinary Center. He poured a 2009 Pinot Gris and a2009 Riesling from Billsboro along with Fox Run 2009 Dry Riesling and 2007 Reserve Chardonnay. The Pinot Gris was dry, with medium body with plenty of citrus flavor up front. The Billsboro Riesling at 2.5% RS tasted sweeter than Shaw’s Riesling and also was very fruit forward with a slight tart finish. The Fox Run Riesling was light, dry, with a slightly tart, lemon finish. The Reserve Chardonnay was bone dry with a light oak flavor achieved by fermenting and aging in oak barrels. We circled back to Shaw when the red hour started where we tried the 2005 Merlot and the 2005 Cabernet Franc. Both of these wines are aged three years in oak, which Steve Jr. told me is unique in the Finger Lakes. The fruit is also hand picked. No beating up the grapes while making these wines. The Merlot was light in fruit and body and was very smooth. The Cab Franc was medium bodied with hints of plum and cherry. Billsboro offered a 2008 Cabernet Syrah and a 2008 Pinot Noir while Fox Run offered a 2007 Pinot Noir and a 2007 Cabernet Franc/Lemberger blend. Both the Billsboro and Fox Run Pinot Noir were comparable to Shaw’s. I particularly enjoyed the peppery finish of the Cab Franc/Lemberger. Hors d’oeuvres were served throughout the evening. There was an assortment of artisan cheeses served with crackers, pâté, a fruit conserve, and a jalapeño pepper jelly. There was also watermelon cubes topped with goat cheese, smoked sausages, and salmon with goat cheese. Chef Carlo gave a cooking demonstration where he prepared pan seared scallops over pickled cabbage slaw. I’m sorry I didn’t take better notes on the food since it was delicious. This was due in part by me focusing on the wine and taking pictures and not paying enough attention to the food. I hope Chef Carlo forgives me. If I get the opportunity I will ask him for details. Jeff did a great job organizing the event, the wineries brought excellent wines for us to sample, Chef Carlo served up an array of wonderful appetizers and gave a great cooking demonstration, and Chef Don provided entertaining and informative commentary. I’m looking forward to more wine tasting events by Finger Lakes Wine Trail Card.